Hello! Time for another giveaway! Woot, woot! The Habit opened a new location in Mira Mesa not too long ago. I wasn’t really excited about this because I figured, eh, it’s just another chain. When I initially went to The Habit a few years ago, I didn’t really care for it. But, since it was new and in Mira Mesa I figured I’d give it another shot. Glad I did! On my first revisit to The Habit, I went for the Chicken Sandwich with BBQ sauce on a wheat bun. I enjoyed the flavor of the chicken – it was nice and juicy and had a nice char from the grill. The chicken stayed quite moist and wasn’t dried out at all – something I really appreciated. I also dig that it was served with orange slices. A solid sandwich! On another visit, I went for the Santa Barbara Char which is a double charburger on sourdough bread with cheese and avocado on top. 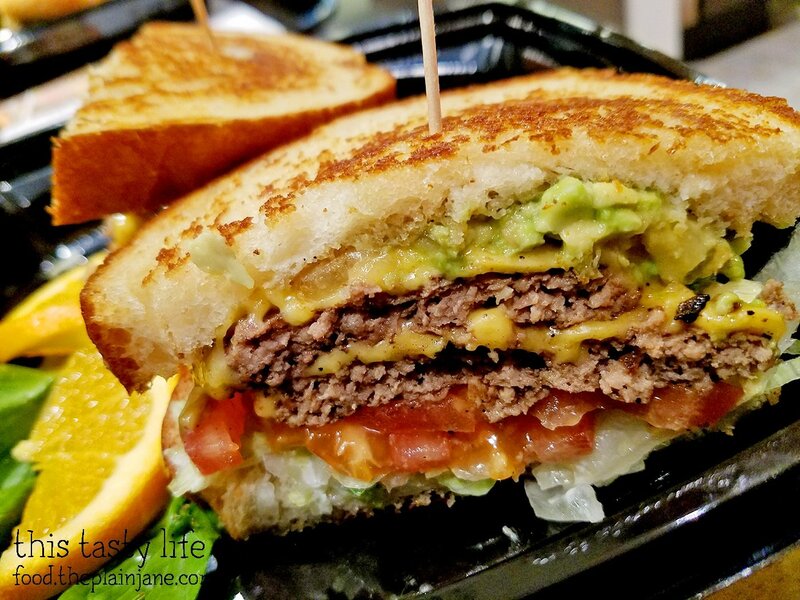 I really liked the crusty grilled sourdough bread on this sandwich! I found it to be too filling though with the double patty action and only managed to eat half of this sucker. Luckily my friend, Alyssa, told me she regularly orders the Santa Barbara Char as a single charburger. This didn’t even occur to me the first time so on a recent visit I went that route and got $.90 cents knocked off the price of my burger. Woohoo! Same great taste, same wonderful bread, and a more manageable size for my tummy. Jake once got the regular old charburger on the normal white bun, and I found that I didn’t really care for it. That’s what I got on that original visit back in the day, so I’ve concluded I just don’t like the plain old charburger at The Habit. That’s okay though since they have plenty of other options that I do enjoy! I’ve got a sweet prize for one lucky ready today! 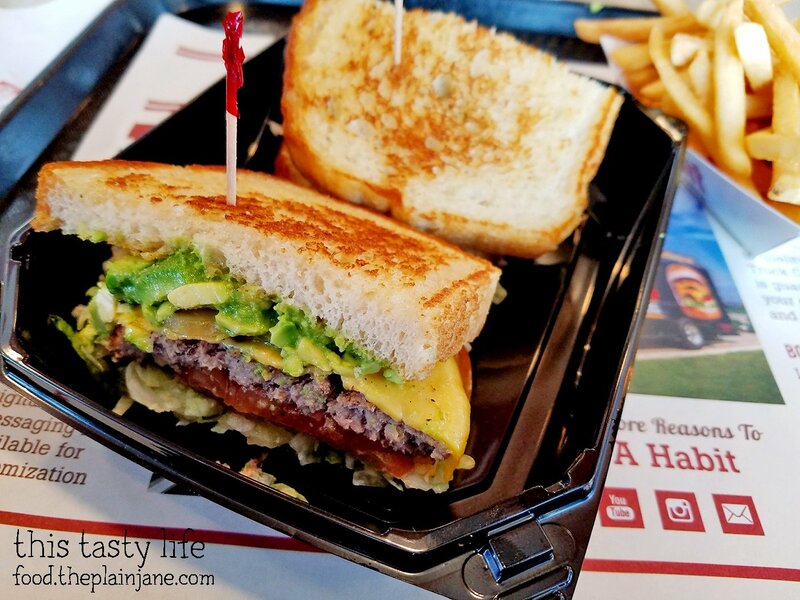 What’s your favorite menu item at The Habit? Check out the menu here if you need to refresh your memory! Also check out This Tasty Life’s Instagram and Facebook pages for additional ways to enter! Entries must be received by June 1st, 2017 at 8PM PST. Winner will be contacted via email and has 24 hours to respond. If no response, a new winner will be selected. Valid only for residents of the US. Disclaimer: I received a $25 gift card plus an additional gift card to give away. All opinions stated here are my own. I build my own burger with blue cheese on it and it is delicious! I enjoy the charburger on toast with pickles , mustard & onion! Never tried it on a regular bun. ? I love the Santa Barbara Char Burger! Very excited about your tip to order it as a single. That never occurred to me, and I always have leftovers too! Well, I haven’t been to The Habit YET, but when I go I would like to try their tri-tip steak sandwich and maybe a mocha shake. I occasionally order the Super Food Salad which is pretty filling and tasty. Mmm I want to eat the BBQ Bacon Charburger again. Thank you! Thanks for posting your blogs. I always make my own Charburger with extra grilled onions, and add tempura green beans on the side. Those things are incredible!! Classic vanilla soft serve cone! So good! I’m from SB, so I grew up with the Habit! My favorite was the charburger, but I’ve never had the SB char, so I’d have to try that! I like the Roasted Garlic Portabella Char Burger. We just got one of these close to us! Double charburger with cheese with raw onions. Their basic burger done just right for me. 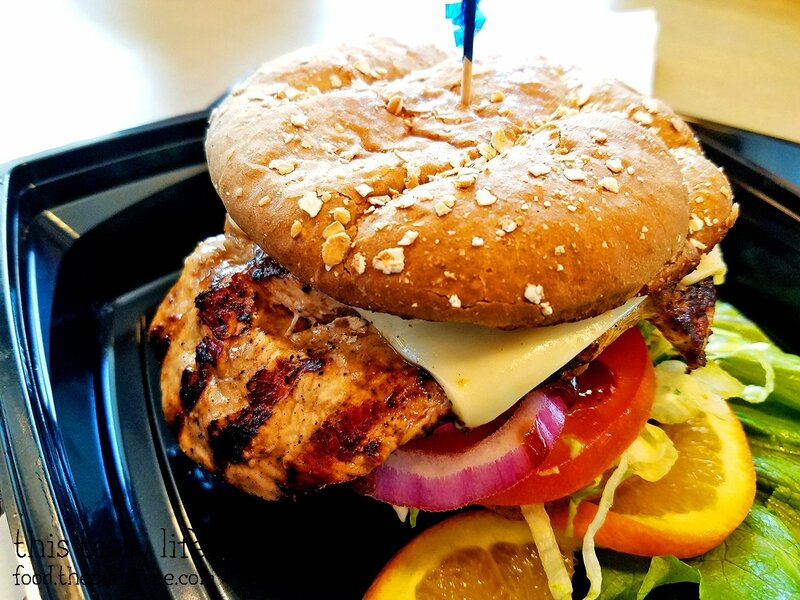 Almost always looks great for pics, and tastes great! I enjoy the charburger with bacon. I want to get the Santa Barbara Char burger! Haven’t been to the Habit yet but would love to try the Santa Barbara Char.